John Zappia returns to Perth Motorplex this Saturday after competing at East Coast Thunder in Sydney on the weekend. Zappia top qualified with a strong 5.66 pass in tricky conditions, but a battery issue with the Fuchs/Dananni Hotshots Monaro stopped it from going rounds. Hopefully there will be no such problems for the famous Monaro come this Saturday. 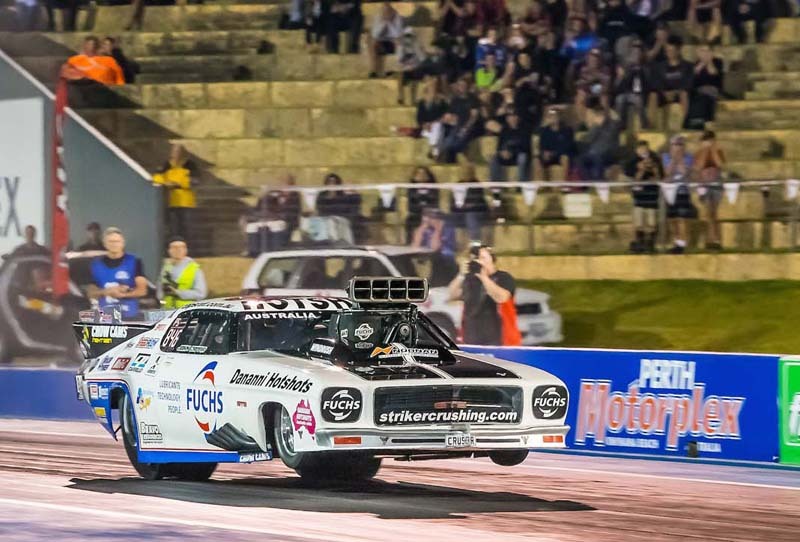 The Fuchs/Dananni Hotshots Monaro will be rested for only a few short days before returning to action at Perth Motorplex as part of the Summer Slam at the WA Drag Racing Championships. Ten teams have entered for the Summer Slam, which provides a domestic series for WA racers. Zappia is hopeful that the sea level air and some recent knowledge gains will help produce a new Pro Slammer track record. “We are going to Perth Motorplex to give it a real good shot with the local championship and see what we can learn over the next three meetings before we head to our next 400 Thunder round at Willowbank,” he said. “We have always struggled to go real fast in Perth, our best is a 5.66 I think. But with what we have learned and the way the car is handling right now we have a good chance of getting into some low sixties in Perth in the sea level air. If it is not too hot it is possible to crack into the 5.5s, but we will see.